Stephanie has everything she needs to prepare for the big show where she’ll shine like a star! Practice her ballet dancing in the big mirror with a balance bar. 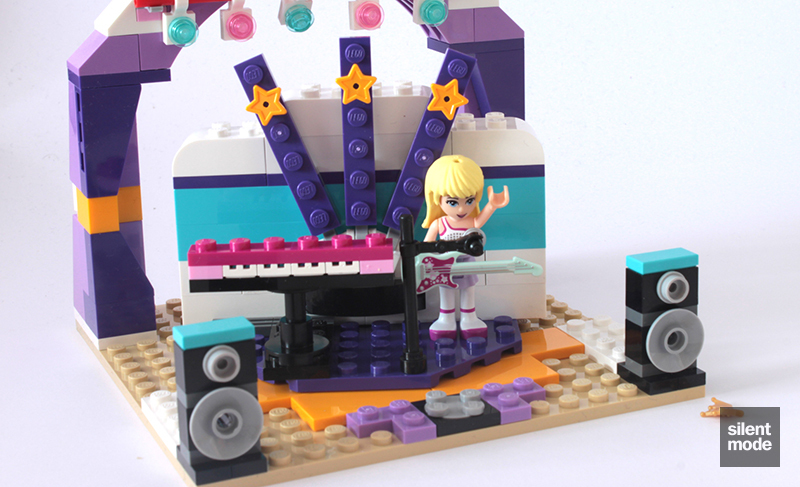 Then rotate the stage to rock out with a guitar, keyboard, speakers and a microphone. Practice until she’s perfect then get ready at the pretty makeup table! Smell the roses delivered to her before the big show as you prepare for the performance with her ice water, a brush and perfume. Once you’re ready, cue the spotlights and start the best show Heartlake City has ever seen! 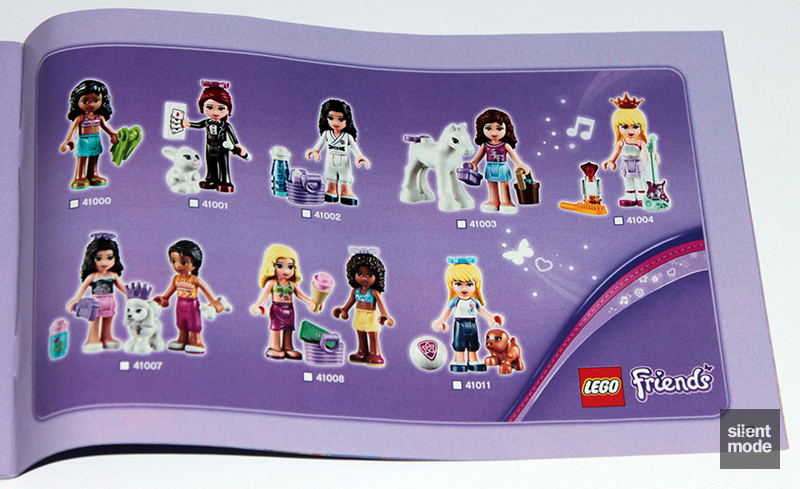 Includes Stephanie mini-doll. Open the makeup table drawers to store accessories! Rotate the stage to switch from practicing to performing! Welcome once again, Friends fans. I haven’t really had time to do a set review, given all the work I’ve been doing on Project Swapfig, but although it’s a bit late I decided to do this review of a set I’ve had lying around for quite a while. I bought this set solely to complete a full set of Friends minidolls, and although from the outset I wasn’t keen on this set, I decided (as usual) to keep an open mind and be objective. This happens to be the only mid-priced Stephanie set I’ve bought out of the entire Friends theme: I’ve passed up the convertible, the dog show and the hot-wired plane, as well as anything else I’ve missed. As usual, from GBP 14.99 and up, we get the thick curved box. It’s a decent sized box for what’s inside, and the colour scheme is highly representative of Stephanie, using pretty much the same colours as the convertible set. 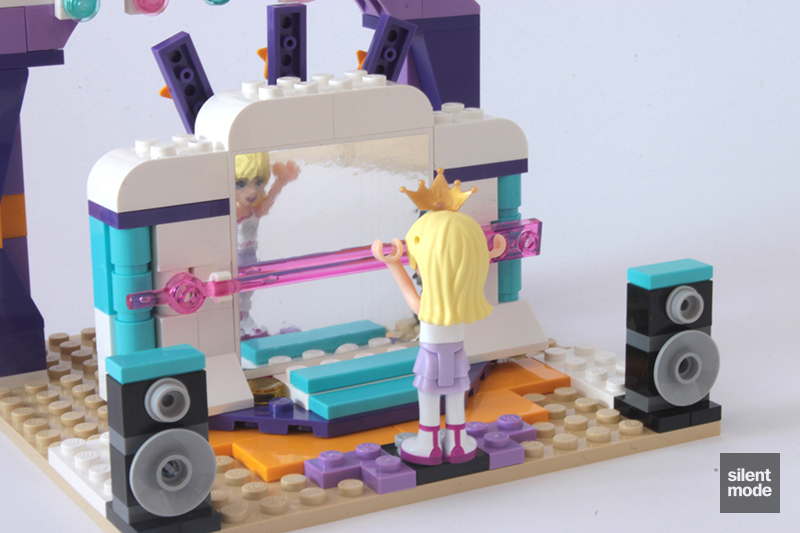 The bottom left corner demonstrates the major play feature: the mirror doing a 180 to reveal a musical stage. The back of the box demonstrates some of the other cool play features, as usual. It looks as if there’s quite a bit to do here. Stephanie herself is used as the scale reference on the box, in an outfit that… well, I’m really not sure what to make of it. She looks more like an ice skater with a skirt on than anything. Inside the box are two big bags of parts, as well as a 16×16 Tan plate, the instructions and a completely reflective DSS. There was so much inside the box it was hard to fit everything into the studio, but it’s good to see LEGO making better use of the space inside the box. Everything was crisp, including the DSS (which is more important than ever in this set). Of course we have out 16×16 Tan plate, which I have been going nuts over since my Games raid the previous Christmas – I have quite a few in my collection, with more on the way. 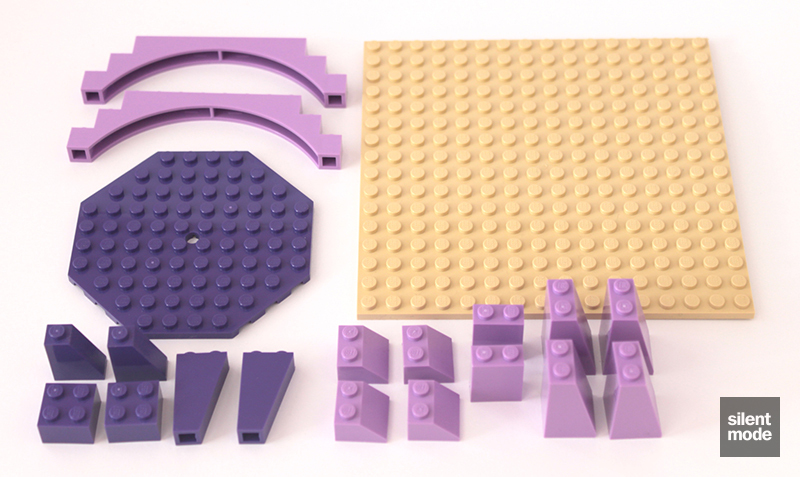 We have more parts to play with for our Medium Lavender fans, including two large arch parts and two 1x2x2 bricks. The octagonal plate in Dark Purple may be useful for some, and is currently exclusive to this set. There’s a small variety of parts in White, most of which are bricks. The 1x6x5 and 1x4x3 panels come in useful, although there’s only one of each. The 1x bricks are particularly appealing at the moment. The modified plate with handles is a part to look out for: there are only four sets with this part in White including this one, and they all have just one of them. All of these parts are useful and enticing, and I’m particularly pleased to see four 2×4 tiles in Bright Light Orange. Thankfully the round bricks in Medium Azure don’t have the animal prints on them. The question is, will we ever get hold of enough of those Medium Azure bricks to build an entire house? I sure hope so. These are the other plates we’ll get to play with in this set, most of which may be useful in our own MOCs. 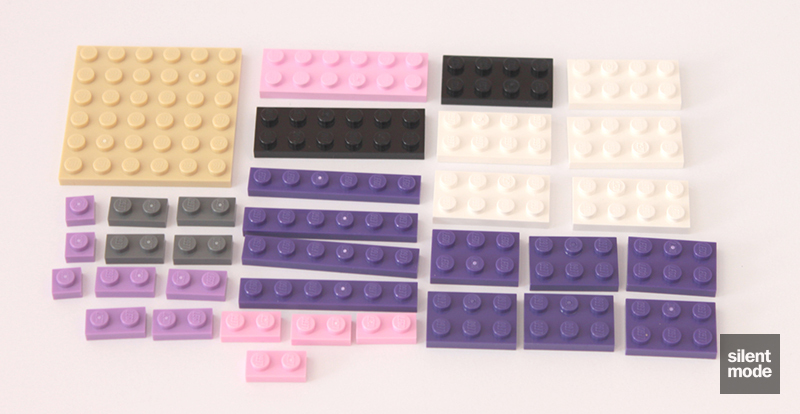 Just be careful not to end up with too many of those Dark Purple 2x3s (which are often spotted in PAB walls). Finally here are some of the more interesting pieces, many of which come from the smaller bag of parts. This is currently the only other set to have those star plates other than Mia’s Magic Tricks, though in a greater quantity (which is very nice). Both the transparent pink bar and the red hose are exclusive to this set, as well as of course the guitar. 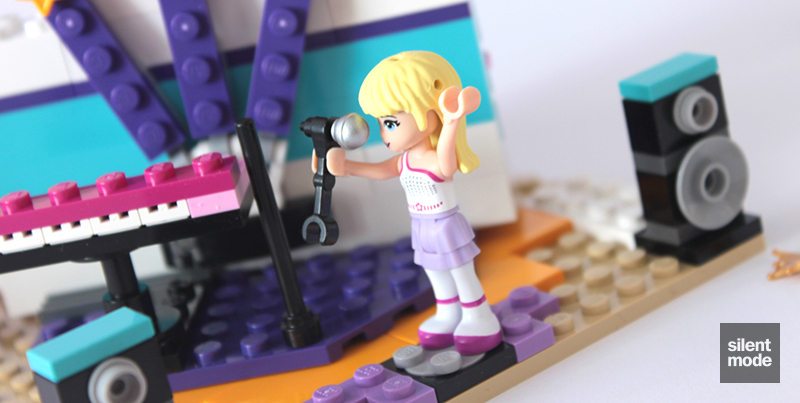 If those don’t impress you, then we also have six of those hot round tiles in Trans Yellow to play with, as well as two of the original microphones from the S2 Collectible Minifigures’ Pop Star. There are also two tiaras in Pearl Gold, which has been making more of a frequent appearance in recent years. One thing to note is that the two Pearl Gold round plates look a lot nicer this time, to the point where I’d hoped they were Metallic Gold instead. We can’t have everything I guess. In any case… here’s Stephanie, and another unique outfit to add to the collection. …as demonstrated by Stephanie here. 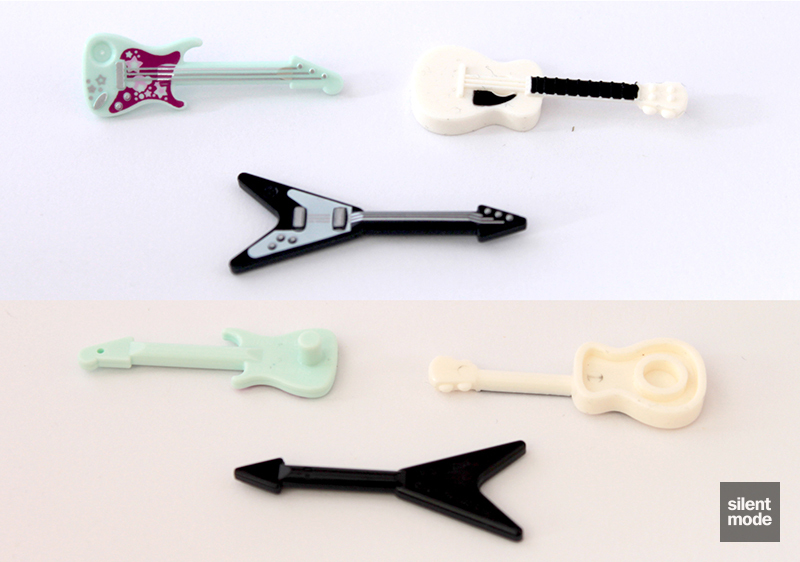 Both the BrickForge and the unique guitar in this set can sit on a minidoll’s hand, but naturally the LEGO guitar (with a bar attachment) is easier to apply. The BrickForge guitar is a tighter fit, and I was worried I might break Stephanie’s hand, but it’s manageable if you really want it. 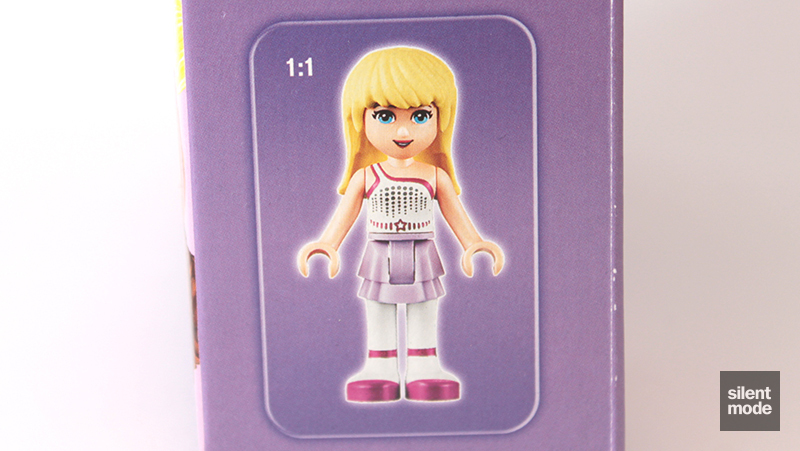 Of course, since minidoll hands are inflexible, there’s very limited positioning available. Let’s get on with the build, shall we? 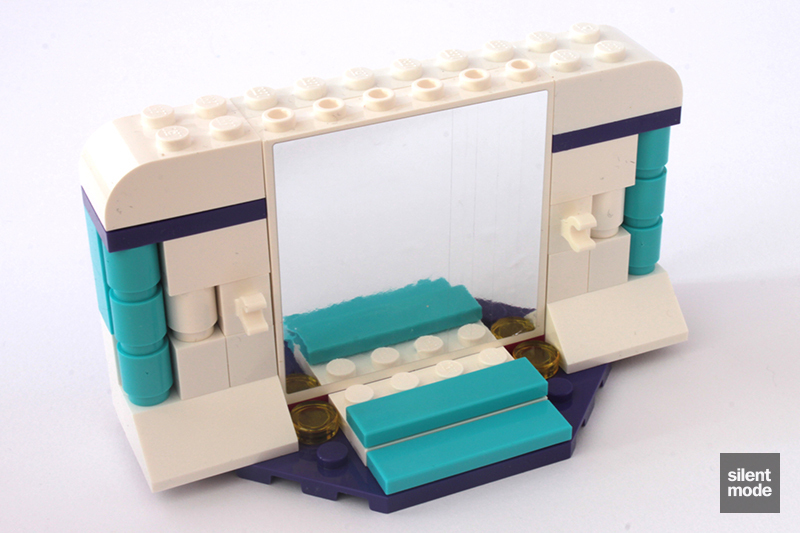 There are only two builds in this set for a change, and the first is this simple dressing table. Yet again LEGO only gives us one pink drawer to put inside the chest of drawers! but I suppose not many dressing tables have a full cabinet. The first of the mirrored stickers is applied to the 1x4x3 panel to make the dressing table mirror, which is also decorated with a couple of star plates and the Dark Purple 1×2 tiles. We finish the dressing table with some ornaments made from the smaller pieces, as well as a hairbrush, and a very simple stool. Yes, I’ve broken my usual rule of not applying stickers – this is because I thought the mirrored surfaces would add to this review. Usually I would keep such a pristine DSS for something else! The Black turntable piece in the centre is the mechanism behind the stage doing a 180, and you’ll see how this works a bit later on. A smaller turntable sits at the front of the stage, though I’m not yet sure what it’s for. Bag 1 comes to an end by adding some curtains to the back of the stage, in a similar style to Mia’s Magic Tricks, except much larger and with more parts. After my experience with the Bright Light Orange bricks in Emma’s Karate Class, I was pleased to see there were no discernible quality issues with those in this set. We also have some very simple speakers to go at the front, made from some 1×2 Technic bricks with a couple of elements inserted into the holes. The story continues with Bag 2 (turn the page! ), where the curtains are joined with a bunch of other parts to form the complete back of the stage. The exclusive red hose is used, along with some other pieces, to make a row of studio lights. Now we come to the remaining part of the stage: the bit that rotates around. 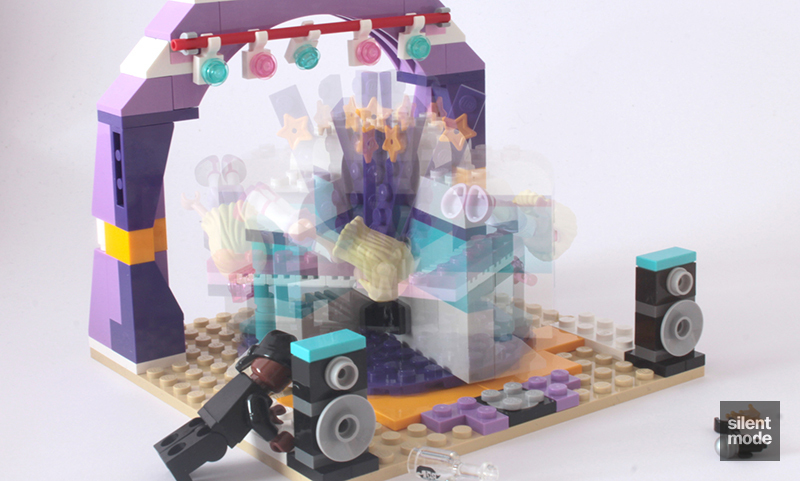 Everything sits on that exclusive Dark Purple octagonal plate, and the majority of bricks form the divide between the dance studio and the music stage. For the time being more work seems to be being put into the dance studio. The last mirrored sticker goes on the 1x6x5 panel. Thought it looks amazingly smooth in this photo, I had some problems applying the sticker: I always got small air bubbles underneath. I think my big fingers did a good enough job, however. 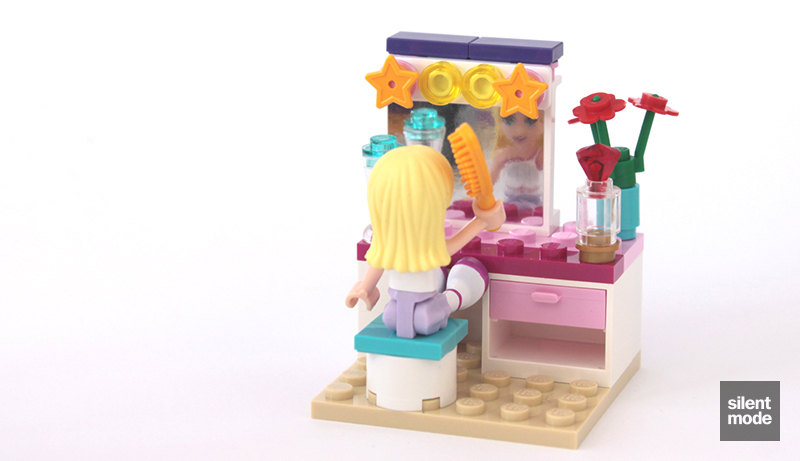 One thing that should be obvious is that the mirror isn’t as crystal clear as LEGO’s promotional imagery would have you believe – but it’s still very reflective. As if this stage didn’t have enough exclusiveness already, that exclusive transparent pink bar makes its exclusive way exclusively into the slot provided by the hooked bricks. 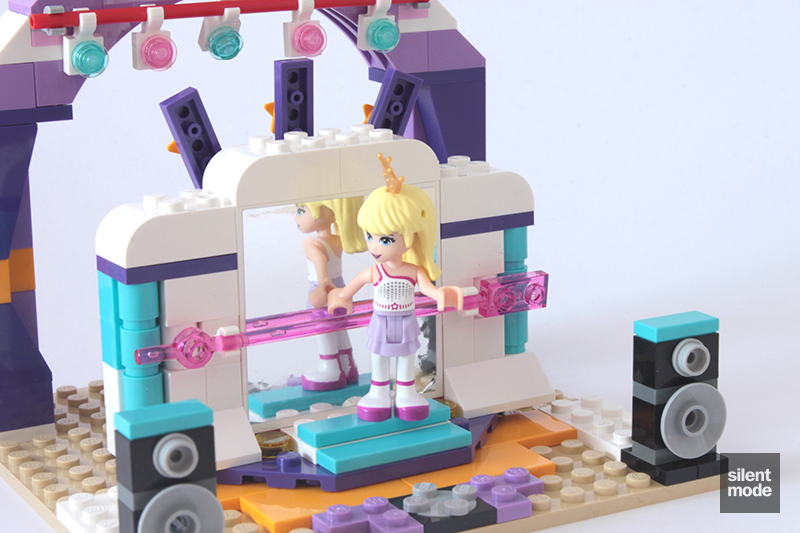 Now we’ve finished messing around with the dance studio, let’s turn our attention to the musical stage. 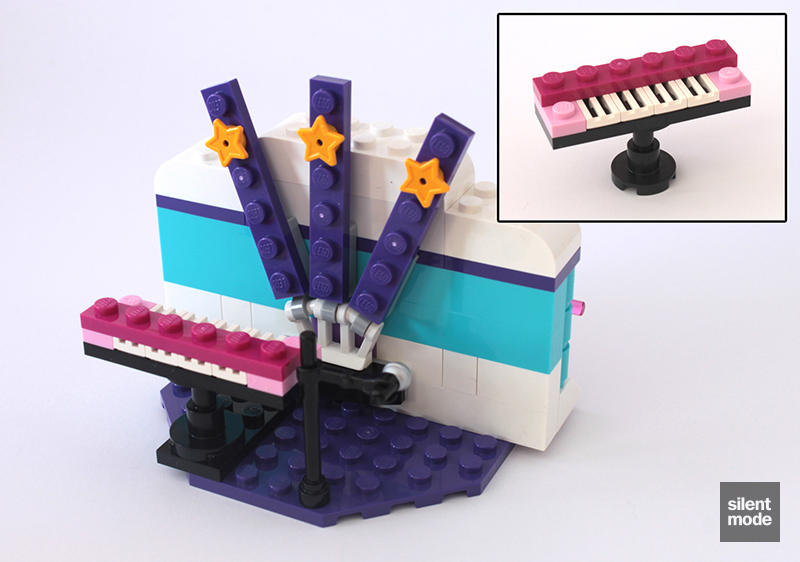 Some embellishments are added to the back, while a very simple keyboard and a microphone stand is added. I’d suspect the design for the keyboard was somewhat inspired by the many AFOLs who discovered the uses of White grille tiles. Wondering how the rotating stage fits on the other part? Well, the octagonal plate has a circular groove underneath, which perfectly fits the Black turntable we attached earlier. It’s not hard at all to attach the Dark Purple plate to the Black turntable, as it’s impossible to make a mistake. As we’ve seen from the beginning: one side of Stephanie’s set-up shows a dance studio, where she can practice her little ballerina moves and other various flexible exercises. With the flick of a switch, that expensive dance studio turns into a rockin’ music stage, complete with instruments and pyrotechnics. Her bathtub lifts up; her walls do a 360. Does Stephanie have what the government’s got? Unfortunately this picture didn’t turn out so well, but there’s a nice little selection of little parts to keep as spares. Very happy about those star plates and the Medium Lavender 1×1 plate, and perhaps the mic and 1×1 round tiles too. 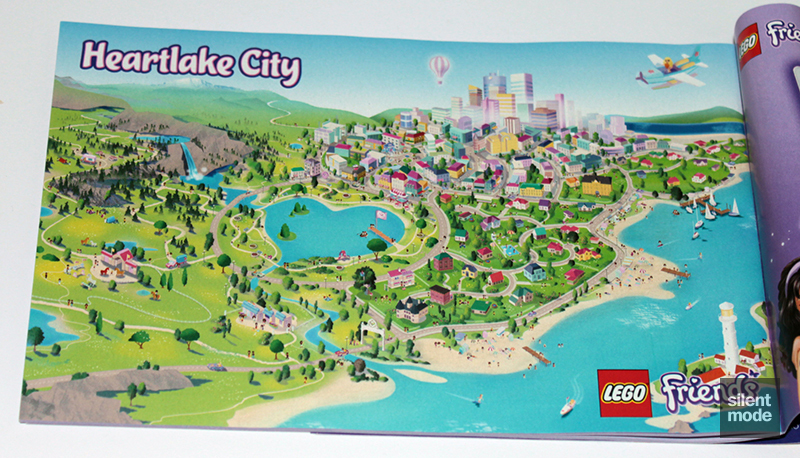 The back of the instructions shows a wider view of Heartlake City, incorporating more of the sets in this wave as well as your past favourites. Mark my words: an air balloon, a lighthouse and a set based in the mountains is surely on the cards. If you’ve been collecting all the Friends sets from this wave… you have too much money for your own good. However, this is a convenient checklist for anyone collecting unique minidolls from this wave. Stephanie begins her ballet practice by spending goodness knows how long brushing her hair. She develops her upper body strength by incorporating some of the techniques she learned in Riding Camp. 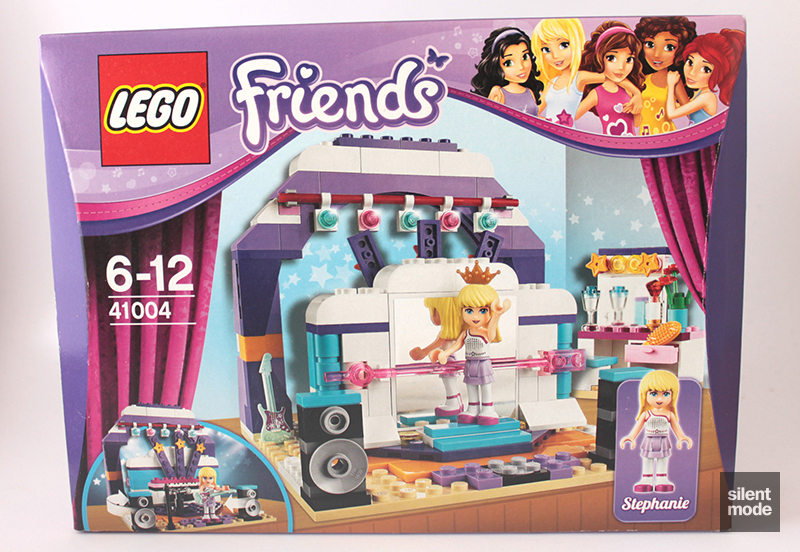 Lame jokes aside… I started out not liking this set initially, because it just seemed like another one of these sets that was put together with parts in the Friends colours (although Stephanie might have had something to do with the opinion as well). However, I came to like it as soon as I opened the box and saw all the parts, and perhaps a bit more as the set came together. In terms of parts, this set is a pretty good hit. 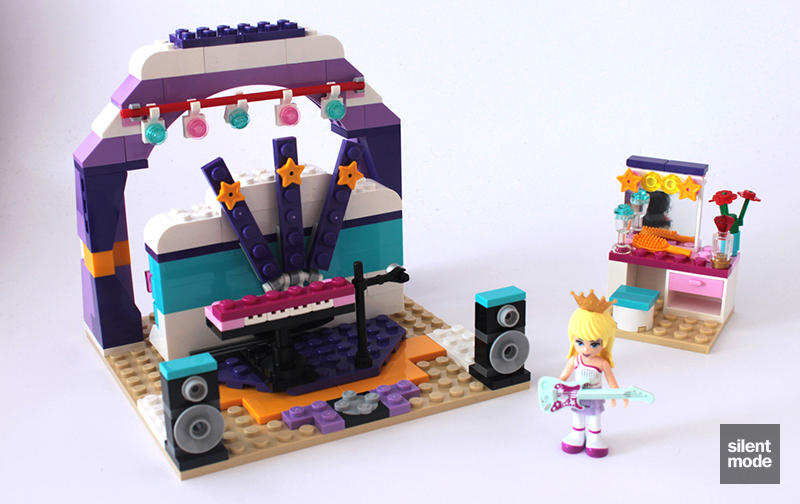 Some of the best parts from the GBP 9.99 sets reviewed before come back with a vengeance, such as the Magenta 1×6 plates, the Bright Light Orange 1×2 bricks and one of my favourite new parts, the star plates. 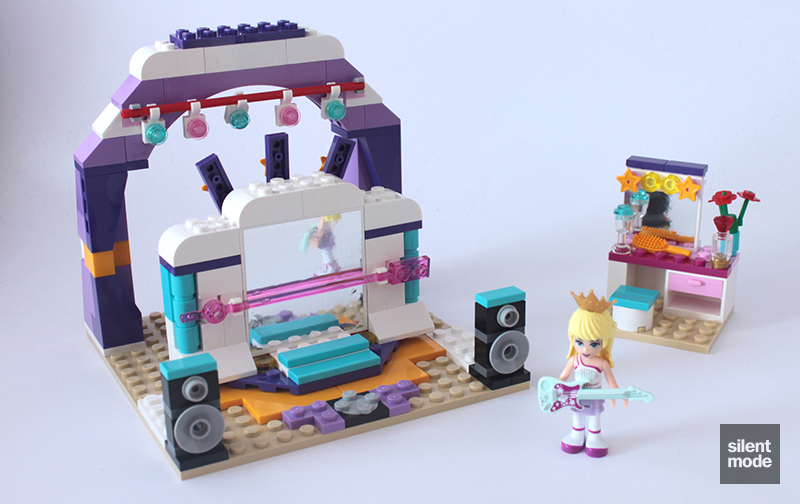 Even if you don’t like the set or the Friends theme, it may be worth picking this set up for the parts it contains, not least for the exclusive minidoll. Unlike with Stephanie’s other mid-range sets, it’s not possible to assemble this figure with parts from less expensive sets; your only other option will be the reassuringly expensive grey market. 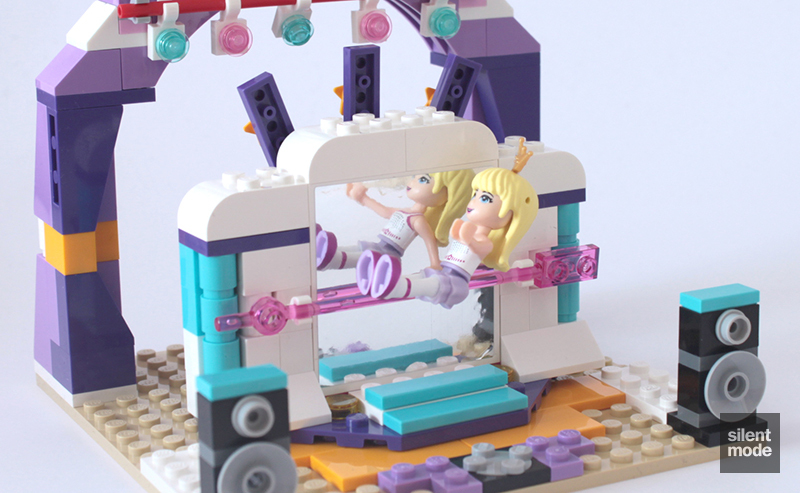 As for the set itself, the main draw of the spinning stage is a big plus, and at least shows how it can be done with just two parts and a bit of imagination. What other things can we do with a rotating stage? 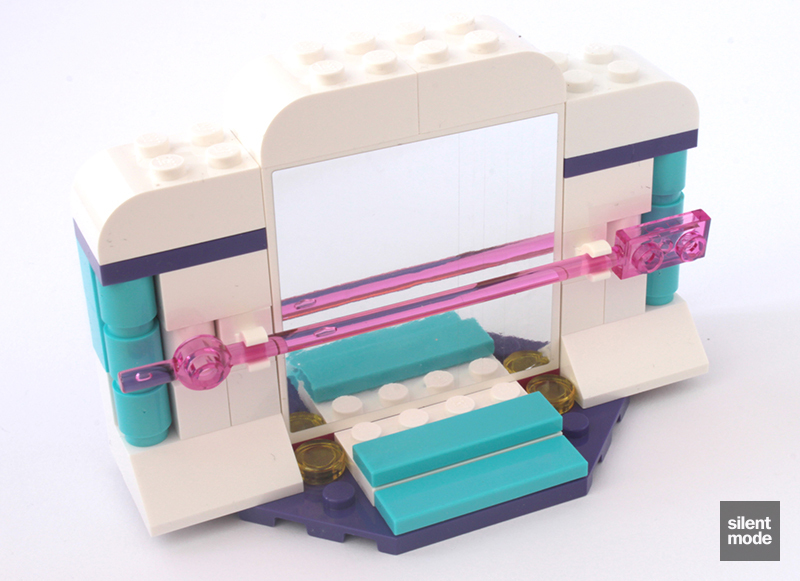 Perhaps a hidden laboratory for Olivia (if she’s still an inventor), or a hidden salon in the Butterfly Beauty Shop. It may be a stretch, but in any case it makes a great play feature. That said about the set’s playability, it certainly feels more like a set for parts than an actual set. 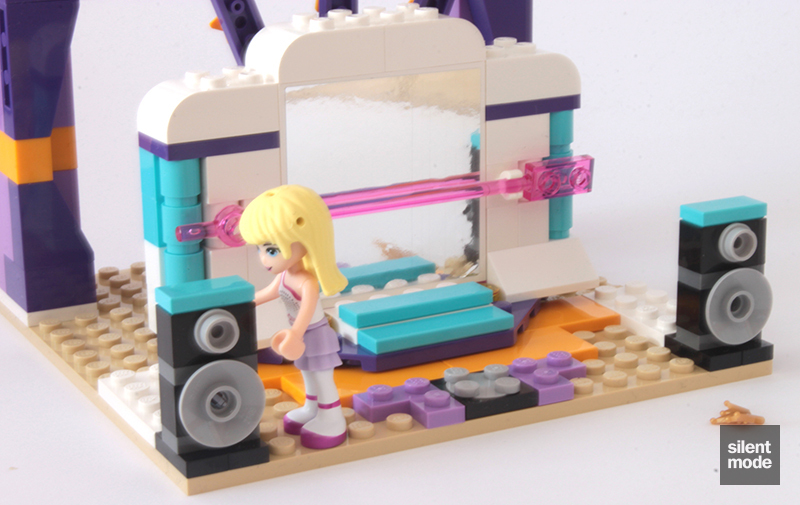 Eventually you’ll probably want to tear it down and build something else with the parts, and then the issue of what to do with those more unusual parts – such as the curved White bricks and the Dark Purple 2×3 plates – will arise. If there’s one major issue with the set, it’s that it really suffers with minidolls not being able to move their legs independently. Although the small turntable at the front of the stage allows Stephanie to do a little twirl, I don’t know of many other ballet moves performed with both legs together. Besides, we all know Stephanie isn’t nearly that pure. I have no idea whether more musical instruments will surface, but besides being able to hold it in a comfortable position, the guitar is just okay. I’ve probably been spoiled by BrickForge’s offerings, but even LEGO’s own “Flying V” is more appealing and feels more robust as an accessory. This guitar feels a lot more like a doll’s accessory than a believable piece of equipment… but that’s just my opinion. I feel a little uneasy about the colour scheme of the main build, as well as Stephanie's unique torso, but the set itself is interesting enough to warrant building. The building process is decent, teasing the builder with the dressing table before finally getting to attaching the stage onto the turntable... it's just that the main build felt a lot like stacking parts on top of more parts. A very attractive assortment of parts (glad there haven't been any more quality issues! ), and a great quality unique minidoll. If anything it's let down by the comparatively cheap-feeling guitar. The typical experience may be playing a little with the dressing table, then spending most of your time alternating between the two stage halves. Then you'll take the set apart and use the pieces for other models, or invent your own rotating stage. Buying the set at RRP is warranted if you're missing the unique Stephanie minidoll as well as the parts, but it's worth waiting for a price reduction. Based on these scores I’m giving a 7.0/10. It’s another one of those times when I think the set’s all right, but would be reluctant to recommend. So that’s it for now, and once again thank you for reading this review. I have one more Friends set from the third wave – Heartlake City Pool – that’s yet to be opened: if you want to see it reviewed on these hallowed pages, hit me up.